Enjoy the sunny patio facing the fairway with its stunning mountain views. Stroll to one of the many pools and hot tubs within the resort or play golf on one of the area's many fabulous courses. Palm Desert is famous for the wonderful restaurants and shops that are located here. Your little home in this gorgeous development is close to all of them. Fully equipped and supplied you are assured superior comfort. The excellent layout suits families and couples alike. You can barbecue your dinner and dine on the patio, wander to the clubhouse and enjoy the service or hit the town for a superb selection of restaurants. Whatever you choose, you will love the experience of living in this first class desert country club. 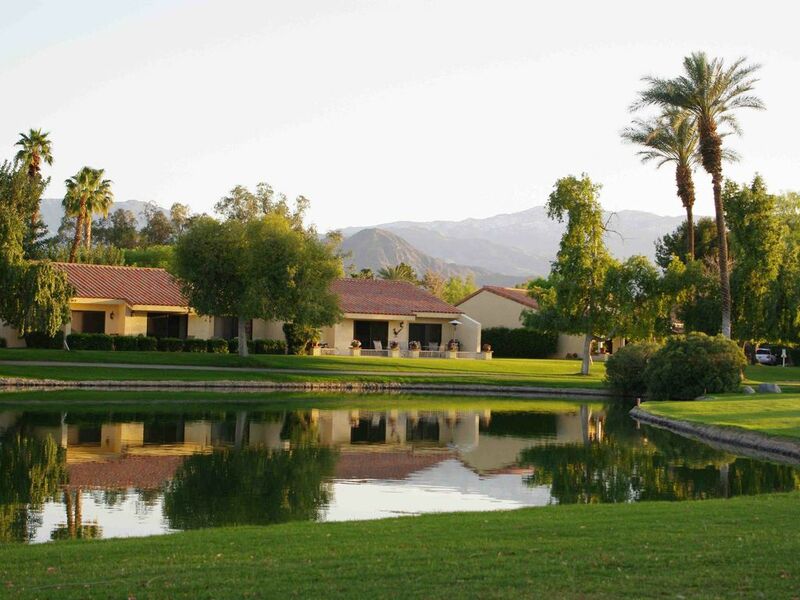 The villa is located a close drive from Indian Wells, home to the BNP Paribas Open tennis tournament (March). The Coachella Music Festival in Indio (April) is also close by! Private, quiet and comfortable. Close to the main entrance and club house. Beautiful views of the golf course, water features and mountains. We are not strangers to traveling to tropical destinations and are aware of critters, but we were very surprised at the lack of support, maintenance and cleanliness of this condo as it was presented to us as being family friendly. This condo does not fit in the category of an executive condo. We will never rent this condo again or recommend this condo rental. Upon arrival the condo appeared visually to be clean however we were overwhelmed with the smell of stale cigarette smoke and within a couple hours a cockroach scurried across the kitchen counter and hid under the microwave. Later another cockroach appeared in the kitchen sink. We contacted “Andrea” and advised her of the critter situation (as where there is one there are more) at which she agreed to contact us in the am of the following day to let us know what they would do to alleviate the situation. We had to contact Andrea the following morning as we did not hear from her and she indicated the cleaner goes to home depot to by the spray and does her house on a weekly basis. She was awaiting a call from the maintenance person and it was agreed she would call back. We never got a call back. • A cockroach approximately 2 inches long in the garage. Hi Jen and Paul - I am sorry to receive your review and apologize that you did not enjoy the condo. It is thoroughly cleaned between guests and I thought was well cared for. When I received your call I did immediately call our representative for housekeeping and maintenance and she confirmed she had checked the condo and had thought everything was in order. No one had reported any bugs and I am truly sorry you saw one. She did call numerous times trying to reach you through out the day, she had the exterior sprayed but would not have gone inside without your permission. I am also sorry that we concluded you were enjoying your stay as we did not hear more from you. Clearly this was not proactive enough and again I apologize. When we spoke I did say you should move if you were in the least bit uncomfortable, that there would be no charge for that, and when you chose to stay, we determined all was well. I could easily have had the housekeepers come and clean at your convenience and it is unfortunate we did not do that. I appreciate you letting me know you feel the condo should be cleaner and I will have a full maintenance scheduled. Note: Until confirmed, rates are subject to change without notice. Cleaning charges may apply for shorter stays.